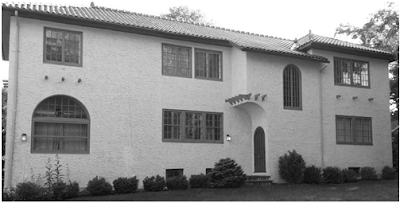 "Gems of South Orange" House Tour - October 17, 2015 ~ The History Girl! Six gracious and distinctive 20th-century homes will be on view in the 2015 "Gems of South Orange" House Tour presented by the South Orange Historical and Preservation Society on Saturday, October 17th. The popular event, expected to attract 400-600 visitors, affords an opportunity to see not only the handsome exteriors but also to examine beautiful interior architecture, décor, and collections. Homes will be available for viewing by ticket-buyers from 11:00 am - 4:00 pm. To preserve privacy of homeowners and to lend intrigue to the event, addresses of these houses scattered throughout the Village of South Orange will not be revealed until Tour day (October 17th). Costumed actors from The Strollers Theater Company will treat patrons to historically themed vignettes at several homes. Another added attraction, a first for the Tour, will be the presence of antique automobiles at the homes. A rare and stately 1917 Reo will be at one of the homes, courtesy of Scott Lefebvre. Others confirmed to date are a sleek all-black '62 Thunderbird convertible from Tomm Scalera, a '57 Chevy vroom-vroom hot rod from Patrick Gethins, and a beautiful 1928 Hudson LeBaron roadster from Bud Sisto. To illustrate the "20th Century Snapshots in Time" theme, the lobby of South Orange Performing Arts Center (SOPAC), will feature a display of 100 years of cameras from Joel Levin's collection. President Karen Marlowe of the South Orange Historical and Preservation Society commented, "If not for the build in the late 19th and early 20th Century, South Orange would not be the village that it now is. We are delighted to highlight the varied architectural details of these special 20th century houses that have been maintained in near-original condition. Each home displayed is preserved just like a snapshot of its era." The SOHPS web site, www.sohps.org, has details of the Tour. All guests will pick up admission tickets, $20 in advance and $25 on the day of the Tour, at SOPAC, 1 SOPAC Way, South Orange, NJ 07079. Purchases can be made at www.sohps.org or through P.O. Box 61, South Orange, NJ 07079. Please note that for security and safety, children under 12; pets, food, and drink; and interior photography are prohibited. Parking is plentiful and free in the NJ Transit parking lot adjacent to SOPAC and the downtown South Orange train station. The lot can be accessed via South Orange Avenue or Church Street. From there, people may drive to house locations, or board free jitney shuttles provided courtesy of South Orange Parking Authority. The jitney is also an option for local tour-goers who elect to go carless for the day. Trains from New York Penn Station (and from stations across NJ) to South Orange Station stop next door to SOPAC. Trains from NYC depart every hour on weekends and take about 40 minutes to arrive in South Orange. Fares for senior and disabled persons are half-price. Information is available at www.njtransit.com. The "Gems of South Orange" House Tour is the major source of funding for SOHPS’ activities. The Society, whose motto is "preserving the past for the future," presents a Historic Preservation Award to an edifice or to a person. SOHPS also hosts occasional public events such as lectures and symposia. Also, the group grants generous college scholarships for winning essays on South Orange history. Questions may be directed to SOHPS via email at info@sohps.org or by phone at (973) 763-2310.